Take care not to place anything in contact with the courtesy lamps. 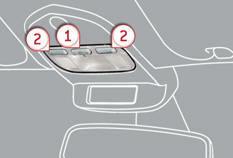 In this position, the courtesy lamp comes on gradually: Map reading lamps With the ignition on, press the corresponding switch. 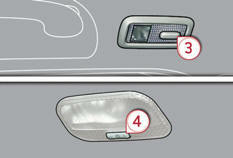 When the front courtesy lamp is in the "permanently on" position, the rear courtesy lamp will also come on, unless it is in the "permanently off" position. With the ignition on, the first press of the reading lamp switch switches on the reading lamp in "permanently on" mode.